Paul sneaking a look at what he thinks is Helen's portrait of him and looking horrified! Scott helps Sylvie carry her luggage into the hallway. The two of them and Jane go and sit down in the lounge room, but Bronwyn comes in a few moments later and asks them to keep the noise down, as Jamie's asleep. Jane looks surprised that Jamie is staying with them. 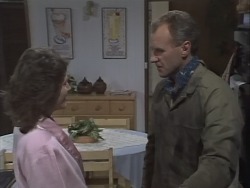 Bronwyn explains that she thought Mrs. Mangel might be upset if *she* stayed at Des's with just Mike there. Jane introduces Sylvie to Bronwyn, explaining that Sylvie is the one she's been modelling with. PAUL: That isn't an interpretation. If that's how gran sees me, she can't think very much of me. It was really bad. GAIL: I know this is against all the rules, Helen, but could I please have a look at the portrait of that husband of mine, because I really don't think I could sleep another night if I don't. I'm starting to dream about it! Helen says she did hope she'd finish it today, but the office had to come first. She takes the cover off a canvas in front of them to reveal a very realistic- looking painting of Paul. Gail exclaims that it's great! PAUL: Do you really think that I look like that? PAUL (snaps): Thanks, Gail. Thanks a lot. SCOTT: You have to admit it would make a pretty good story, though: ‘Lassiter's lovely thumbs her nose at fame and fortune' etc., etc. SYLVIE: That's not the point. *Make* yourself the model type. Do what *I* do: find a plastic surgeon. SCOTT (blankly): What are you guys talking about? 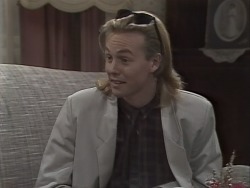 SYLVIE (mutters): We're talking about a very plain teenage schoolgirl by the name of Latham. Boys wouldn't go near me. SCOTT (exclaims): *You*? Come on, I don't believe that. SYLVIE (bitterly): Believe it – I've got the photos to prove it. Fat... ugly... zits... Huh. You name it, I had it – ‘til one day yours truly was involved in a very bad car accident. I ended up with more glass in my face than a cathedral window. SYLVIE: Look, it was the best thing that ever happened to me. OK, I had to get very sick to lose all that weight. When the plastic surgeon removed the bandages, the body and the face made a very good team. SYLVIE: Well... why don't we mix *your* business with *my* pleasure [she giggles girlishly] over lunch tomorrow and we can talk about it then. JANE: Sylvie, I told you before: he's married. HENRY: Sylvie, Sylvie, Sylvie... I'm going MAD for this woman! Scott goes on that he was going to run the story on Jane, but the more he thinks about it it's becoming Sylvie. Henry asks if that will upset Jane. Scott assures him that Jane can't stand the attention: he'll still be running the story on her but it won't be as big. HENRY (beams): Tell me more! SCOTT (looking puzzled): Wait a second – I thought you and Bronwyn were the item of the week. HENRY (sighs): Yeah... funny about that: so did I. All she wants us to be is friends. SCOTT: Dipped out again, huh? HENRY: Story of my life! Serves me right for chasing girls! Now Sylvie... Sylvie is a *woman*! When are you seeing her again? HENRY: You know... *I* knew a plastic surgeon once. He fell asleep in front of a fire and melted! The front door opens at No. 28 and Mike and Des head inside. Des's hands are still covered in bandages and the dressing remains on his forehead. Bronwyn welcomes them home. Mike starts fussing, but Des insists that he's OK. He asks where Jamie is and Bronwyn tells him that he's all changed and ready for his dad. Des heads off to the bedroom to see his son. Mike warns him not to pick Jamie up; he has to remember the condition of his hands. Left alone with Bronwyn, Mike tells her that if it's going to be a bit difficult for her to stay there, it'll be just as easy for *him* to look after things. Bronwyn, looking surprised, says she didn't mean to push in... but she'd feel awful if she couldn't help out. GAIL: What's got into you? Oh, I get it: this is all because I said I liked the portrait, isn't it? PAUL: Well, if that's the way that you see me, maybe I should smarten up my act a little bit, eh? HELEN: I'll leave you to it – I have to make Des a casserole before I start work on the portrait. Silly, isn't it: I'm getting quite nervous about showing it to Paul! Beverly is changing the dressings on Des's hands. Mike tells her to make sure Des knows not to overdo it. There's a ring on the doorbell and Mike answers it to find Henry standing there. He heads inside and comments that it looks like Des is ready for a title fight! He adds that Des should take it easy; Harold will be taking care of the Coffee Shop, won't he? Des, however, replies that there's nothing much he can do: it'll be a good month before they can redecorate and open again. Mike goes off to feed Jamie, followed by Bronwyn. When they've gone, Henry remarks to Des that Mike and Bronwyn seem pretty chummy. DES: Yes! Tell you what: Bron's a really nice girl. She's moved in here until I get back on my feet again. HENRY (looking surprised): Um... you mean living here? SYLVIE: This is another one taken on the Manly ferry. SCOTT: I just want to see a photograph of *you*, not the ones you've *taken*. SYLVIE: I've been in *all* of them. Sylvie points herself out in the photos. A look of astonishment crosses Scott's face and he exclaims. SCOTT: That's *you*? I don't *believe* this. SYLVIE (bitterly): That's me: plain, dumpy little Sylvia Latham with her plain, dumpy little sisters and her plain, dumpy little parents. I get sick just *thinking* about it. SCOTT: Why? They seem pretty nice. SYLVIE (angrily): Who cares, Scott? Nice is boring. Nice is having babies and getting excited about how white your washing is. Beautiful is having what you want *when* you want it. You like ‘nice', it's yours. I'll take ‘beautiful' every time. SYLVIE: Later? I know it's silly, but I'm a little upset now. I don't think straight when I get like this. SYLVIE: You know, you can use that wonderful expense account of yours and take me to dinner tonight! SCOTT (warily): Apart from the fact that I don't *have* an expense account, I don't know... I just don't think it would be such a good idea, that's all. SYLVIE (flirtatiously): And why not? Don't worry, Scotty, I won't eat you... Besides, it's a good story; a *very* good one. Be a pity if I had to give it to another paper, wouldn't it...? 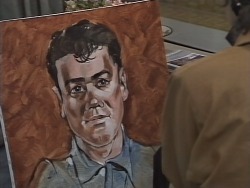 Helen is working on Paul's portrait when Beverly arrives home. Helen remarks that she's home early, and Beverly explains that she needs more sleep. Helen comments that she's still worried about that malpractice suit. Beverly admits that she is, but that's not why she's home early. She doesn't elaborate, saying instead that she's going to grab forty winks and asking Helen to let her know when Jim arrives home. HENRY: If Bouncer had a face like that, I'd shave his other end and teach him to walk backwards! HENRY: Sylvie. That's her, isn't it? Princess Plastic. I'll never look at another woman for the rest of my *life*! But are you trying to tell me that those two are the same person? SCOTT: It's the truth. Is this a story or isn't it? SCOTT: Forget it, Henry. By the time I have dinner with her tonight, she'll be jetting off to some other place. HENRY (tersely): Excuse me... did I hear you say ‘have dinner with her'? You: my sister's husband? HENRY: Take care, mate. I mean - if Lennie ever finds out... can you imagine? HENRY (grimly): Yes – *funny* business. HENRY: And have her laugh at me? As far as *I'm* concerned, she can *have* him. Who needs her, anyway? Paul is looking at a letter and photo. Gail asks him if Nina and Amy are well and Paul nods that it sounds like it: the wedding went off OK. 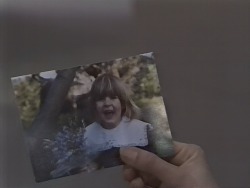 He shows Gail a photo of Amy as the flower girl. The front door opens suddenly and Helen walks in. Gail asks her what she's looking so excited about and she replies. HELEN: Two things: first – and most important – the portrait is finished. It's just waiting for you to see it, Paul. PAUL (disinterestedly): Yeah... perhaps after dinner maybe, eh, gran? Not right now. HELEN: Anyway, I'd very much like to include your portrait, Paul. PAUL (staring at her in astonishment): No! Look, I may as well come clean about this, gran: I've *seen* the portrait. Now, I wish there was a nicer way to say this, but there isn't. I hate it. I think it's offensive and I take it as a personal insult. No, you may *not* show it at the fête. 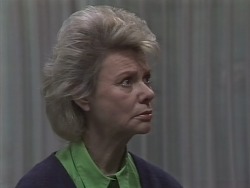 A look of astonishment crosses Helen's face. JIM: You're pregnant, aren't you! BEVERLY (grins): We most certainly are! Confirmed at two o'clock this afternoon! JIM: That's wonderful, darling. Come here!